A few weeks ago I took the LI railroad into New York. There was a young gentleman on the train platform waiting for the 6:01 pm. The polar vortex hadn't arrived yet, so there were no clouds flying in with snow dustings or blizzards. But it was still cold and the young man was bundled well with coat and cap. He scrunched into his wheelchair feeding warmth to its frame and taking it back as he hunched over his gaming or texting, or Tweeting, deep into it. What drew me to him were those wheels and that chair! OMG. It was hot, metallic-looking, one of those dark reddish colors. It was high powered with gadgets galore and whippet mobility. I knew he could lean back and do wheelies Vrummming on the straight and wide on a sunny, hot day. I was impressed! That chair was beautiful. We both got on the train. I positioned myself near him in the car's jump seat as he zipped in, unassisted, ready to rock and roll and answer texts. I saw that's what he was doing. I had to grab his attention during this transfer. Better now than interrupt him when he was texting some honeys. "Hey, really like your chair." Nodded my head and smiled. "It's cool. Looks like you can make some real speed with it." My words produced a huge sparkling white grin. "Well, thank you. I manage pretty well with it." I talked about my cousin who needed a wheelchair because of her arthritis but was too proud and stubborn to have one. I told him if she saw his, she'd love it and maybe she'd feel better about herself having to use a wheelchair. My cousin popped the cork. He poured out some personal details. He hadn't always been in a wheelchair. He said his story was "something." He said it took him a long while to adapt to what happened. He said he was depressed and really down after the reality that he couldn't walk hit him. But then, "things changed." "Faith really helps you get over those hellish times," I added, nodding my head, inside feeling a bit cautious. I didn't know if I was being lame talking to an atheist. But I ventured 'cause I've learned there are no atheists in wheelchairs. Like there are no atheists in war zone ditches under drone fire. And this applied to him at least on one count. Maybe two. He assured me he had a lot of faith. That got him through the situation he had been in. I was sooo curious and I listened so intently my forehead must have been crinkled up with my eyes more rounded and larger than their usual smallish shape. I guess my eyes are like beacons signaling the talker. "Go on. I really wanna know what happened." He said that he relied on God and always prayed. His faith and his family's prayers helped him get out of the grovel he had been in. The kid in me popped up and moved my tongue for a question that was personal and way over the line. Somehow I managed to shut up. He had been in a nursing home for a long while, three years. He didn't go out. He didn't want to go out after a while. 'Cause it was like a prison. And you get institutionalized. There were a lot of guys in there with him who were really down. It was pretty awful. When things changed, he was able to leave and go home. 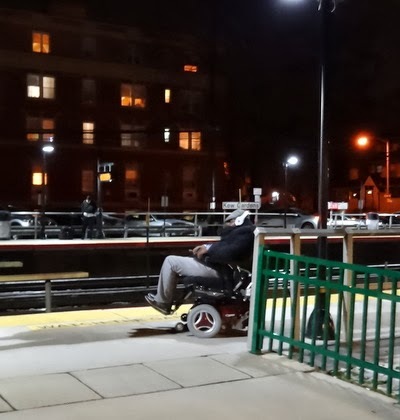 And now he was going to school and playing wheelchair sports and tooling around visiting friends and taking the LIRR and talking to me. I told him I was a journalist and writer. I wrote articles some about vets and I was concerned the government wasn't doing enough for them. I told him I did what I could to petition all sorts of causes and one of the companies I advocated/wrote for gave people with disabilities their lives back with adaptive vehicles. He said he used to drive, loved it, missed it. He was really interested in independence. Driving gave him that and he had renewed his license though he had been held captive in a nursing home. He said he'd love to get behind the wheel. I told him what everyone knows, how SUVs and cars can be completely transformed for Quads or Paras or people like my cousin: whomever for whatever reason. 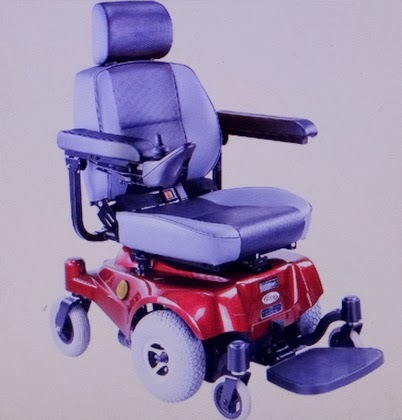 Now you can match wheels with your wheelchairs. Today, folks can travel as far as they want to wherever. The technology is so advanced, people are only limited by their minds. He said the guys he had left back in the nursing homes wouldn't go out...were depressed; some wanted to die, thought their lives were over. That's why he'd go back and talk to them, help out, encourage. We exchanged information. And I told him something maybe I shouldn't have. I told him I'd like to interview him. Have him tell me his story. My readers would be interested to know. The train had arrived at Penn Station. I shook his hand and we said goodbye. I watched as the conductor (they're called that on the LIRR) walked him off the train. He was taking him to an elevator. Thinking back to my comment about the interview, I realize those are pretty tight words. Everyone's life is private. Sometimes, you need to just move on and not discuss things. I did learn later what happened. He was out with friends. Some guys saw his jewelry and he was robbed. And he was shot. The bullet left him a C 4-5 Quad. Though he hasn't gotten in touch with me, I always will remember JF. That day I met him was his birthday. I thought the interview might be a sort of present. But upon reflection, I see it is the reverse. I think he is God's present to me and to the world.